Do you want credit sharing on add on and multiplayer levels? I would like to see more missions where you have 1 or more allies either in campaign, add on, or multiplayer missions where you can send spare credits to help them out if they become bankrupt during a mission. Anyone else want to see that? It is a good idea but there doesn't seem to be any sign of that being worked on yet, comment back if you agree. I played a map before where their was a pad and you stepped on a pad and some money did get transfer. So I think it's possible already. But it would be help full when your teammate has to leave and just transfer all of his credit to you before he has to leave. True I have seen that, I think there should be an option to interact with an AI or player controlled allies warehouse or extractor that allows the credit transfer. A dollar note symbol perhaps that when clicked asks how much you want to send. Anyway thanks for the votes so far! Hey i been noticing you been posting on some old topics. Just by adding the bare minum(sorry for spelling) it doesnt help. The best way you can help is adding your own advice to slove the problem. Then other players can say yes its a good idea or they can challange your idea to see if theirs any flaws. Or it maybe the best idea of all. I didnt think of this before i made that old post but heres my new idea. Why not just have the storage tanks be able to be raided by anyone. That means your enemy and your partner/partners can raid your storage tank. It its flawed cause what happens if your partner doesnt want you to win. Well that would fall under knowing your partner better. Sharing credits can be done now, but the maker of the map would have to do fancy triggering. It would have to be done where like side 1 steps on a pad, it adds 100 credits two side 1's alliance and subtracts 100 credits from side 1. Its a pain to do that. I would like to see this built into the game. When a player taps their credits indicator a keybaord would come up and they could enter how much they want to send and what side they want it to go to. There could be a trigger in M.exe to enable/disable credit sharing because it would ruin some maps to have credit sharing on them. Yeah. You could give a precise amount if it was built into the game. If map makers made it in the map (which is possible) you could only have it transfer [number] of credits when a [unit] steps on a pad or area. It would be a set number if it was built into the map. Yeah I've had a couple maps with credit sharing, its easy to do, but if players want it theyd need to give me details for how they want it. How about something kinda like this? A player could tap on the credits indicator, and a menu would appear. They could then tap what side they wanna send credits to. 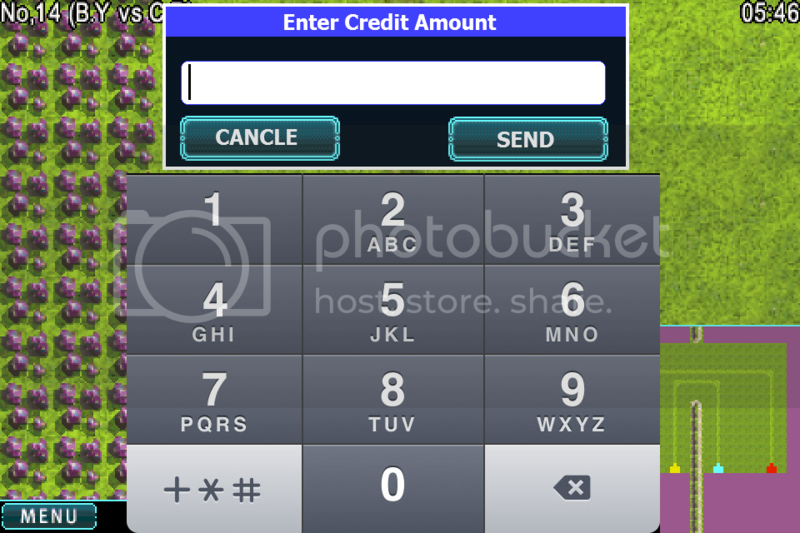 Next a keyboard would appear allowing them to enter an amount. An option to see your allies credits (and maybe power) could be useful with this too. So if your ally asks for credits, you could see if they really need them. Maybe. I was thinking it would be easier if you could enter a custom amount. What if you wanted to send someone 10000 credits? If you had to hit a button that gave them 100 credits each time you tapped it, you'd need to tap it 100 times just to send someone 10000. Haha i meant 1000 not 100 but i think one button would be easier to implement. I've always fancied the idea of using a unit for credit transfers. There could be a cargo unit (or perhaps a repurposed bullpup?) which carries 500 credits or, if insufficient, will carry as much credits as the player currently has. The credits can be redeemed by moving the trucks into an allied player's building - similar to attack order, except that the unit will move adjacent to the target building and disappear (or in the case of a bullpup, just unload their cargo). Implementing credit transfers like this would have a profound effect on the current meta. An immediate credit transfer could upset the balance of some maps (Say you decimated an opponent's mining operations. Your opponent could get back into the game in a mere matter of seconds if his well-established ally donated a large sum of credits). Also, this could lead to potential meta where one player focuses on mining while the other focuses on attack. The mining player could send a continuous stream of credits to his militant ally. With supply trucks, it makes credit transfers that much more risky. Supply truck usage would also encourage players to destroy their opponents by surrounding their base and cutting off their logistical tail so as to prevent any outside support from coming in. Thats really cool for maps that dont have teammates right next to each other.